When we originally looked into the 3 methods for engraving slate signs to determine which method we would use to engrave our range of quality slate house signs we compared the different engravings closely and then made our decision. 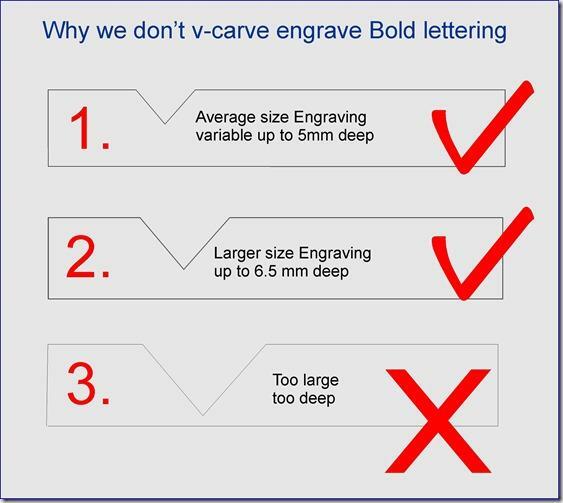 We decided on engraving method 3 shown below because of the beautifully shaped lettering it produces. 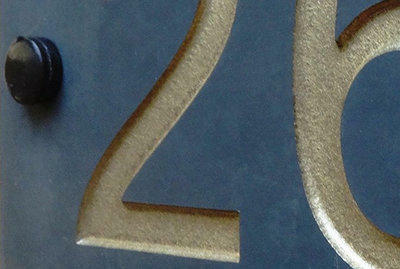 We only offer v-grooved engraved lettering and numbers and not the other methods. Please be aware that some online sign companies mention 'deep engraved' slate but these signs are usually are sandblasted to a depth of around 1 to 2 mm. Of course in comparison to laser engraving the sandblasted signs are deep. However our v-grooved slate signs are engraved to a depth of 3.5 mm minimum to 6.5 mm maximum depending on the height of the text for a house name or number. - The larger the text, the deeper we have to engrave the v-grooved lettering up to 6.5 mm deep. 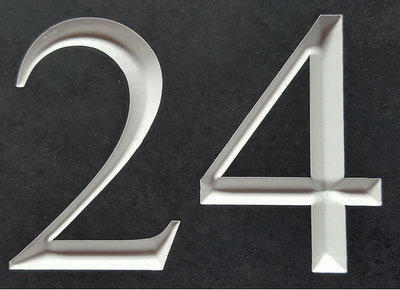 Sandblasted signs are made cutting a rubberised stencil of the text and sticking it down onto the face of the slate. Grit is the sprayed at the stencil at high pressure. This chips away small particles of slate inside the stenciled parts. A quite speedy method for making reasonable engravings in the stone and it can be colour inlaid to give a better contrast. Sandblasted slate has a shallow engraving and the flat region in the letters have a somewhat 'bumpy' surface as shown in the example above. This method can be used on thin roofing slate or on thicker tiles. Also known as V-carved or V-cut engraving our V-groove engraving method utilizes a CNC router which is turning a 'V' shaped tungsten blade at rapid speeds to engrave deeply into the face of the sign. This strategy takes longer than the above two methods but outcome gives considerably crisper lettering with a significantly more detailed cut and smoother lines in in the lettering. 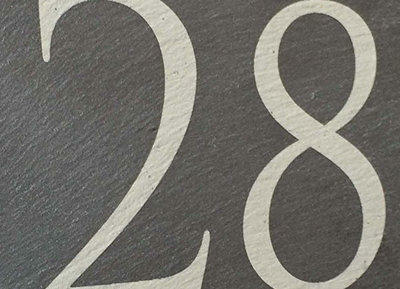 We think this is method gives the best engraved house numbers and house names on slate. V-cutting text into stone has been around for millennia. It was utilized by the Romans and Greeks and other civilizations with extraordinary achievement and the engravings can even now be seen and read today. They utilized a V formed chisel and a mallet to incise their lettering by hand. Throughout history V-cut lettering has always been very popular in the UK for memorial plaques and house name and number plaques. By comparing the 3 images above you can see why we opted for the V-grooved engraving system.